were that the official Games typography be used, adherence to the color palette be maintained and that there be no duplication of sports. Photos and sketches were submitted to the LAOOC for review prior to final design of the posters. 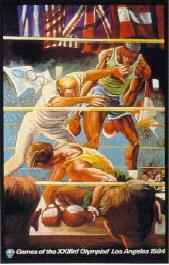 Ernie Barnes, an athlete turned artist, was commissioned by the LAOOC and the Los Angeles Area Chamber of Commerce to draw on his sports experience and knowledge to create Olympic-related art. 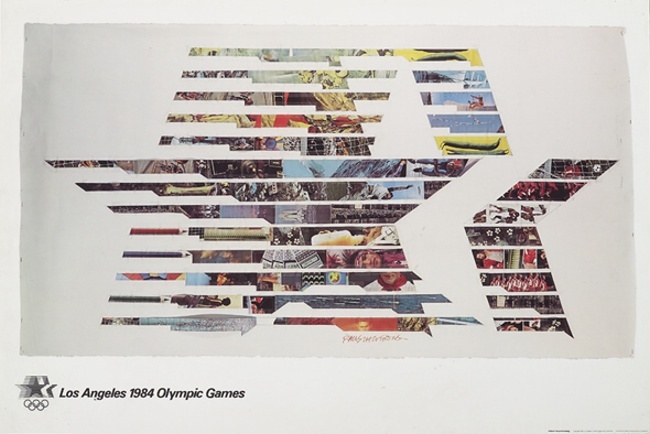 The posters sought to portray the ethnic diversity of Los Angeles, the power and emotion of sports competition and the singleness of purpose and hope that go into the making of athletes. 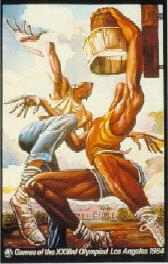 Specific sports served as central themes in four of the posters, with community involvement the theme of the fifth poster. 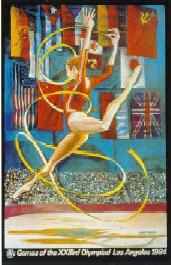 The posters were entitled: The Rhythmic Gymnast, The Finish (Track and Field), One-on-One (Basketball), Winning (Boxing) and The Neighborhood Games.